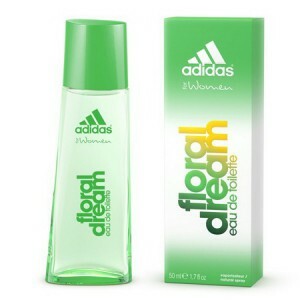 Adidas Floral Dream fragrance is aimed at energetic and cheerful athletes. Adidas Floral Dream Perfume 50ml. by Adidas, Launched in 2005 and created by jean pierre bethouart. This fragrance has top notes of bergamot and gillyflower; a heart of rose and lily with a base of tonka bean and vanilla. Because women are multi-facetted, Adidas offers contemporary fragrances that express all their moods and emotions. Discover these fragrances for active women looking for scents that capture the intense sensations of life. Adidas Fragrance Booster Eau de Toilette offer you a boost of energy and a long lasting fragrance feel all day long. Adidas Floral Dream could be characterized simply. Own sophistication with a combination of femininity and classic elegance. All this combines the irresistible and unique perfume. Floral Dream fragrance is pure, captivating and refreshing, thanks to the proper essence of the composition, which combines the distinctive bergamot, violet magic, wicked rose and tonka bean with tender vanilla. Created for women who are supporters of beautiful floral scents, which like to use mainly in summer months, and on several occasions in his spare time. Perfume Adidas is a sports - elegant scent that will certainly come in handy for a variety of occasions when you want to look and smell nice, but feel comfortable and their. Floral Dream, like other scents from Adidas are among the affordable luxury, which is especially suitable for sporty and active people. Experience floral dream that you can dream every time over applied himself to the charm of lush nature. Always be his, ask to feel comfortable and relaxed. The perfume from the Adidas brand it will be a breeze!